This dreamy ponytail was created by the woman who's responsible for half the hair on Instagram, Kristen Ess. Twist hair into a knot and instead of pinning the ends up, let them flow free. Beaut. This plaited knot is the epitome of chic. To recreate, pull hair into a ponytail at the nape of your neck and secure. Plait the lengths and then twist your braid upwards and pin into the ponytail band. Gone are the sickly pastel pinks of 2017; 2018 calls for muted tones like this faded blush-pink bob. Thanks for the inspo, @Ponysmakeup. For 2018 there's nothing better than a basic black ribbon. Whether you're wearing a ponytail, plait, braid, or bun, be sure to tie it up with a bow. Oh, and bonus points if it's velvet. Simone Rocha adorned models' hair with a bunch of embellished hair clips at her Spring Summer 2018 show. Recreating this look is super easy—you guessed it, just place bejeweled barrettes in your hair! Question: Is there anything more adorable than a teeny-tiny hair bun? Proof: Beauty Vlogger, Allana Davison. Miu Miu made us want to dig out our '90s sweat bands after their Spring Summer 2018 show. Because if Kaia Gerber is wearing it, so are we. We've moved on from the messy topknots; 2018 calls for a low-slung banana bun. 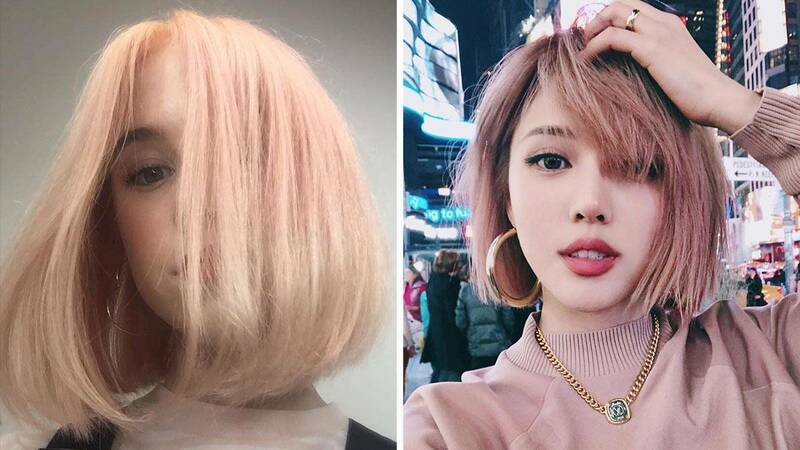 This faded peach bob is one trend you have to try in 2018. Bandaged ponytails captured our hearts at Uma Wang's Spring Summer fashion show. Simply take a piece of fabric and wrap it around your ponytail, taking it about half-way down the length of the hair. Easy-peasy. Statement headbands are making a comeback for 2018 and we're 1,000% getting on board this bandwagon. Warm tones will be a winner in 2018, so opt for toffee-tinted babylights through the mid-lengths to ends of your hair. Bored of balayage? This rich, cocoa-inspired brown is trending for 2018. Forget highlights, brunettes should add layers and a fringe to break up the statement shade. We've moved on from the ice-white blondes of 2017 to cool, classic, caramel hues. Blondes should look to Canadian Vlogger Allana Davison for hair-spo—trust me, you won't be disappointed. Your school-girl hair slides of the 90's have officially grown up... Yep, get ready to fall for oh-so chic embellished barrettes in 2018. Pile your tresses up into a ballerina bun for the new year—the bigger the better.